Salt and athletes: Shake it or leave it? Some athletes sweat so much they end up crusted with salt; they wonder if they need to eat extra salt to replace what was lost in sweat. Other athletes avoid salt like the plague; they see no need to add it to their food because the typical American diet already contains way too much. And then there are marathoners and triathletes who read about their peers who have died of hyponatremia (low blood sodium). They wonder if they should start eating salty foods as a part of their daily sports diet. Perhaps you too have wondered about the role of salt, or more correctly, sodium (the part of salt associated with high blood pressure) in your diet. This article can help you figure out if you should shake it or leave it. Salt is made up of two electrically charged particles: sodium and chloride -- also called electrolytes. In your body, sodium helps keep the right amount of water inside and outside your cells and in your blood. During exercise, if excessive water intake dilutes the sodium outside the cells, too much water seeps into cells and they swell -- including brain cells. The symptoms progressively appear and the athlete feels weak, groggy, nauseous, incoherent, and then may experience stumbling, seizures, coma and death. Athletes at risk of developing hyponatremia include slow marathoners, triathletes and others who exercise for more than four hours and are highly vigilant about hydration, to the extent they drink more fluid than they lose in sweat. Over time, they accumulate a large enough intake of water to dilute the blood sodium. Consuming sodium-containing sports drinks helps, but it doesn't protect against hyponatremia because sports drinks offer far more water than sodium. The typical sports drink may have only 1/5 the concentration of normal blood serum. While dehydration is a far more common concern than overhydration, all athletes can avoid either problem by knowing their sweat rates. To learn your sweat rate, weigh yourself naked before and after exercise. A one-pound drop equates to losing 16 ounces of sweat and means you should target drinking 16 ounces of fluid during similar exercise bouts. Knowing your sweat rate takes the guesswork out of drinking during exercise, and reduces the risk of health problems associated with consuming too much or too little water. 1. How much salt you sweat. Some athletes have saltier sweat than others. Salty sweaters tend to develop a crust of salt on their skin after a hard workout. Other athletes, in comparison, have a low sodium content in their sweat -- and no white salt stains on their skin or exercise clothing. 2. How much you sweat. Athletes who sweat heavily lose more sodium than light sweaters. The amount of sodium in sweat averages about 500 mg sodium/lb sweat (and ranges from 220 to 1,100 mg) If you lose two pounds of sweat per hour for four hours of intense biking, tennis, football practices, etc., your sodium losses become significant (4,000 mg). You should eat salty foods to replace the losses. 3. How much you exercise in the heat. If you aren't used to exercising in heat, you may lose 1,100 mg sodium/lb of sweat. But if you're acclimatized, you may lose only 300 mg. This means if you are training in the winter for a marathon that happens on an exceptionally warm spring day, you might need extra sodium during the marathon (such as Gatorade's Endurance Formula). The kidneys regulate sodium balance. That is, if you overconsume 200 mg sodium, your body will get rid of those 200 mg through urine -- unless you have salt-sensitive high blood pressure. In that case, the body retains too much salt; which means extra fluid is retained in the blood and blood pressure rises. As you age, your sensitivity to sodium increases, as does blood pressure and the associated risks of stroke, heart and kidney disease. An estimated two to five percent of people aged 25 to 34 have high blood pressure, as do 31 to 36 percent of 55- to 65-year-olds. Of these, about 1/3 to 1/2 are salt-sensitive. To reduce your risk of developing high blood pressure, you should not only eat a low-sodium diet, but boost your intake of calcium, magnesium and potassium --three minerals that help counter the negative effects of sodium. Consume extra fruits, vegetables and low-fat dairy foods for potassium, magnesium and calcium. Exercise (and lose weight if you have weight to lose). Limit your intake of alcohol and fatty meats. 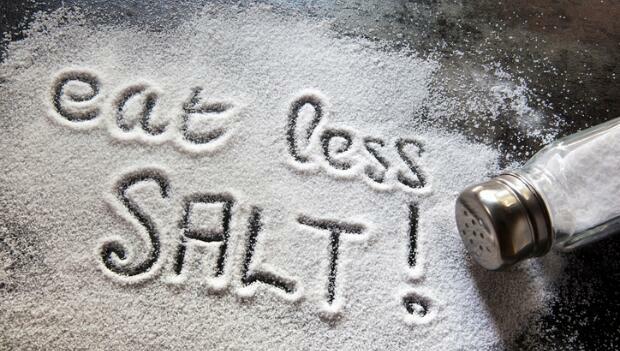 Moderate your salt intake by eating less processed food. How much salt does an athlete actually need? For non-athletes, the body only needs 500 mg sodium and the U.S. Dietary Guidelines recommend no more than 2,400 mg sodium/day. Most Americans easily consume 3,000 to 5,000 mg daily, mostly through processed foods (ramen noodles: 1,700 mg/package, spaghetti sauce: 600 mg/half-cup, cold cereal: 250-350 mg/serving). Sodium enhances flavor and helps prevent spoilage. Most active people consume adequate sodium, even without adding salt to their food. For example, you get sodium from bread (150 mg/slice), cheese (220 mg/oz), eggs (60 mg each), and yogurt (125 mg/8 oz). Athletes who are extreme sweaters probably need more sodium, but generally consume more, particularly if they eat fast foods. Just two slices of cheese pizza (1,200 mg) or a Whopper (1,400 mg) can easily replace sodium losses; no sweat! Sports Nutritionist Nancy Clark, M.S., R.D., counsels both casual exercisers and competitive athletes in her private practice at Healthworks (617-383-6100), the premier fitness center in Chestnut Hill, MA. Her popular Sports Nutrition Guidebook, 3rd Edition, Food Guide for Marathoners, and Cyclist's Food Guide are available at www.nancyclarkrd.com.